Herzog’s feel for character and narrative are fallible. Thus Stroszek stays remote, sometimes to a fault, from its characters, particularly Eva (Fassbinder semi-regular Eva Mattes, who later did a gender-bending Fassbinder impersonation in Radu Gabrea’s A Man like Eva ), Stroszek’s sometime roommate and translator. 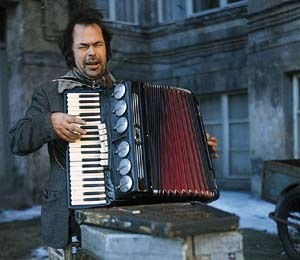 But Herzog’s gift for finding or creating expressive images is one of the glories of the cinema. The installation of a mobile home on a piece of vacant land is wryly humorous; the subsequent departure of the home, leaving Stroszek alone to contemplate his solitude, is oddly poignant. The owlishly angular features and television-pitchman manner of a foreclosing banker are at once bitter and funny, particularly as he persists in speaking English to Stroszek, who speaks only German. Indeed, broken communication is a recurring motif: Bruno is mute through much of the final third of the film, and language consistently isolates him from his surroundings, particularly after Eva abandons him. The isolation and futility become almost palpable after Bruno’s house and television are sold at auction. When he and his friend set off to rob a bank, they find it closed. They shift their attentions to a nearby barber shop, and there, at least, the old man’s brandished gun overcomes the language barrier. Bruno’s “getaway,” particularly a brilliant series of shots of his truck moving down a highway or into a fog bank, as if in a quest for a space in the landscape, is likewise futile. Finally, his truck breaks down and Bruno, in resignation, orchestrates a series of kinetic monuments to futility that culminates in the grimly metaphoric and hopelessly confined dancing chicken. Werner Herzog’s “Stroszek” (1977) is a surrealistically stylized saga about the trio of European eccentrics’ awkward attempts to settle into American freedom. The film concentrates mainly on the psychological, not material problems of the emigrants, and, through analysis of their encounters with life provides thoughtful criticism of American viva-survivalism, money-fetishism, a lack of disinterested intellectual energy, excess of consumerist ecstasy, and a drastic disproportion between a dominant physical relations with nature and a rudimentary spiritual one. The European refined but infantile narcissism meets the American rational but de-sublimated one with tragic consequences for the main characters whose emotional refinement and “poetic” non-practicality turn against them in an atmosphere of pop-sensibility and fake prosperity. The film analyses two types of socio-political power – traditional (direct and obvious), and the innovative and post-modern – financially and economically manipulative. Herzog’s imagery in this film delivers existential meaning with socio-psychological straightforwardness and yet is aesthetically independent from it and “fetishistically” enjoying itself with all its beauty. 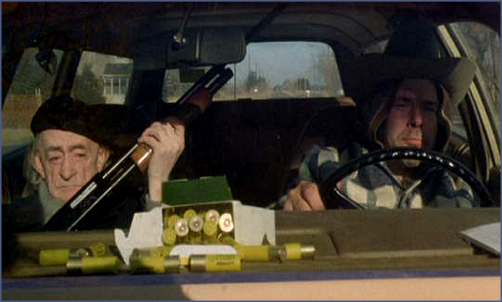 Visual images in “Stroszek” intrigue and astonish us while their meaning makes us bitterly laugh. The film forces us to question ourselves as Europeans (by our past), as Americans (by our present and future) and as human beings in general. Please, visit: http://www.actingoutpolitics.com to read the essay about “Stroszek” – “A Surrealistically Comic Parable about European Escapees to American Freedom: From Europe to US – From Narcissistic Self-image to Narcissistic Systemic Logic” (with analysis of clips and stills from the film), and also articles about films by Godard, Resnais, Bergman, Kurosawa, Bunuel, Bresson, Antonioni, Pasolini, Alain Tanner, Cavani, Bertolucci, Fassbinder, Wenders, Rossellini, Moshe Mizrahi and Ronald Neame.